A former Commissioner of Information in Imo state, and a member of the Imo state All Progressives Congress (APC) Coalition Alliance, Vitalis Ajumbe, has lampooned Governor Rochas Okorocha for allegedly instigating the impeachment move against his deputy, Eze Madumere. Ajumbe claimed that the allegations leveled against the deputy governor were all baseless, alleging that Okorocha was on mission to witch-hunt Madumere and those perceived as enemies of his government. Owojela's Blog reports that the state House of Assembly commenced impeachment processes against Madumere last week, accusing him of being an ex-convict, among other allegations. But Ajumbe, in a chat with the Media on Wednesday, said, ”What I want to say about the impeachment action against the Imo deputy governor is that: he who alleges, also has to prove because when they say Madumere is an ex-convict, Imo people will be expecting to know how he was imprisoned, What made him to be imprisoned. 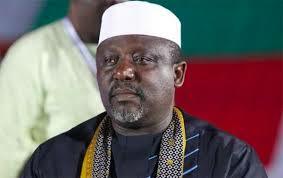 “Is it now that Okorocha is knowing that the deputy governor was imprisoned. Up to twenty-seven years he has been with Governor Okorocha, he didn’t know he was imprisoned. The governor made him his ADC, to Chief of Staff, from chief of staff to deputy governor.